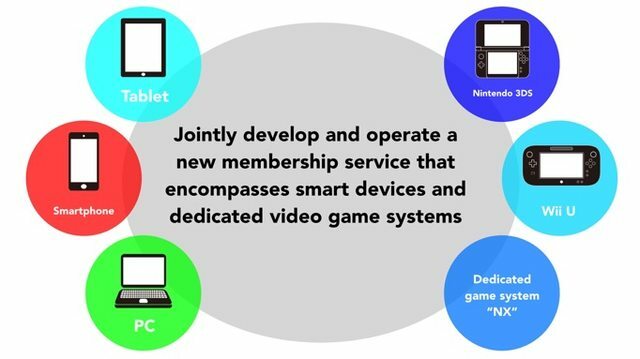 "All Nintendo IP are apart of this collaboration"
Today, Nintendo and DeNA publicily announced a “business and capital alliance” to bring Nintendo IP to smart devices. With DeNA's experience with the smart device industry with Nintendo’s gaming expertise, this will officially enter Nintendo into the mobile market that they have been hesitant on for years. The idea behind the partnership is to bring new games to these devices and not port the games already made for Nintendo 3DS and Wii U. These new creations are supposed to enter newcomers to the world of Nintendo to the point that they upgrade to a Nintendo 3DS and/or Wii U to continue those experiences. The big thing is that this will be part of a bigger online service slated for multiple devices. This service is set to release this fall, and will be accessible from smart phones, tablets, Nintendo 3DS, Nintendo Wii U, and even Windows PC. DeNA, not Nintendo, will be handling much of the development on the service and games. Apparently this will be a long partnership since the two companies exchanged stock to solidify their stance on the service: Nintendo will net 15,081,000 in DeNA treasury shares that equates to 10 percent of their total stock valued at 22 billion yen ($181,293,778); and DeNA will be receiving 1,759,400 shares of Nintendo's stock equaling 1.24 percent of their total public shares and roughly around the same value. No titles have been announced, but Iwata has announced that this will not interfere with their own hardware and software development. In fact, Iwata announced Nintendo has a next-generation hardware in development, codenamed “NX.” Nothing is known from this device other than that it will utilize DeNA’s online service and will be a dedicated video game platform, not the quality of life project they have been hinting on for a while.